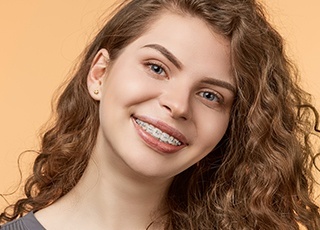 When our patients are experiencing significantly crooked teeth, noticeable open spaces, or other tooth misalignment concerns, the orthodontists at Victoria Pediatric Dental & Orthodontics are here to help with the transformative power of braces. For children and teens, braces can work wonders at creating a smile that’s much more uniform, gives confidence, and is healthier for years to come. How early should I bring my teen in for an orthodontic consult? We strongly recommend that you bring your son or daughter in for an initial consultation by the age of seven. However, many of our new patients are in middle or high school. If we see signs that early intervention is necessary, then we can step in to help your younger child’s smile get on the right track. In most cases though, our younger patients will be ready for braces once they have lost all of their baby teeth - which is normally around the age of thirteen. The great thing about Victoria Pediatric Dentistry and Orthodontics is that we’re not just an orthodontic office. We are a pediatric dentist as well: meaning you have everything your teen’s smile could ask for under one roof. There’s no need for our patients to go anywhere else! We recommend you start bringing your child in for routine cleanings from a young age, when their baby teeth are just starting come in. This is usually around the age of one. Since we’ll be seeing a lot of your family as we perform regular checkups - we can just as well keep an eye on your child’s orthodontic needs and act by incorporating braces when necessary. What are Braces and How do They Work? The final stages of traditional braces also incorporate the use of elastic bands to move the bite and jaw into position. Key brackets have “wings” attached to them and the elastic bands hook around them. An elastic will connect one top tooth bracket to a bottom tooth bracket, tugging at the overall arch. Your teen will be shown where and how to wear them, so that treatment progresses properly. With all of these components working together, the wires exert a gradual amount of pressure on the teeth so that they shift towards the position our orthodontist desires. The results are straight, properly aligned teeth over a specific period of time. 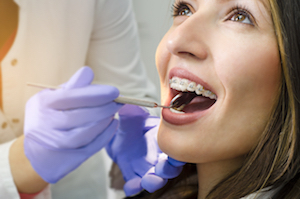 What Options do Teens Have Other Than Traditional Metal Braces? Our practice also offers a more image-friendly orthodontic alternatives in our Victoria, TX orthodontist office in the form of clear/ceramic braces. If you’d rather stay away from all wires and brackets, then we have choices for that too. If your adolescent qualifies - they can enjoy the comfort of Invisalign Teen clear aligner therapy. With Invisalign Teen there is no metal and it’s a nearly invisible process. What are Some of the Indications That My Teen Needs Braces? Overcrowded teeth: This issue makes brushing and flossing teeth very difficult and, in some cases, nearly impossible. Cavities are more likely to develop with overcrowding. Various bite problems (crossbite, underbite, overbite, openbite): Jaw alignment issues can cause TMJ pain, neck pain, and headaches. If you or your teenager are suffering from any of these issues, we can help. Significant gaps between teeth: This condition also makes cleaning your teeth difficult, can alter your speech patterns, and make it hard to chew. Vertically misaligned teeth: In some cases, teeth are out of line or set too far up in the gum. This is a more complex issue to deal with, but our orthodontist in Victoria, TX has the training and experience needed to correct it. How Often Will My Teenager Need to Visit the Orthodontist During Treatment? When one of our patients is undergoing orthodontist treatment, we’ll want to see them in our office for a checkup about every six weeks. This visit will give our orthodontists the ability to adjust appliances as needed and ensure that the teeth are progressing at a good rate. What is the Average Length of Time for Braces Treatment? With traditional braces, your teenager will have an average treatment time of about 18 months. Each case is different however, and the length of time will depend on their individual needs and compliance. During the initial consultation, we can give you an idea of about how long the treatment will take. Keeping appointments and following home care instructions are key to progressing tooth movement along as expected. Can My Teen Get Their Teeth Cleaned While in Braces? Have you ever heard anyone say that braces cause cavities? Well, this isn’t true. It’s a lack of dental hygiene that causes decay. While your teen is undergoing orthodontic care, it’s imperative that they visit us regularly for routine cleanings. On average we see patients twice a year. If your child’s dental hygiene routine is lacking, then we may need to see them more frequently. Orthodontics is a large commitment and investment - so we want to help ensure that when your child’s braces get removed - their teeth look amazing. In order to so, we’ll all have to work together to keep their teeth healthy. At home, you can support your child by providing them with the necessary supplies that they’ll need in order to maintain a clean smile. Flossing threaders, a water flosser, fluoride toothpaste, or an electric toothbrush can all help make things easier. The skilled pediatric dentist and orthodontist team of Victoria Pediatric Dentistry and Orthodontics offers personalized, high-quality care. To schedule your consultation today, contact our pediatric dentist in Victoria, Texas. We’re happy to help your son or daughter achieve a healthier, brighter smile!